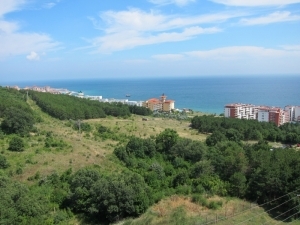 One bedroom apartment for sale in Bulgarian Black Sea - stunning sea view and overlooking to Sunny Beach resort and the ancient town of Nessebar. Holiday Village Crown Fort Club is situated in the quiet and picturesque area between St. Vlas and Elenite, at the foot of the mountain and only 200 meters from the beach. At the same time close to Sunny Beach, easily accessible by public transport. The view from the resort is superb - a gorgeous sea view overlooking Sunny Beach and the ancient town of Nessebar. The private beach of fine golden sand, crystal clear sea and the fresh mountain air, make this place an exceptional for a healthy and relaxing holiday. The complex offers a variety of opportunities for sport, recreation and entertainment: four swimming pools, children's pools, water slides, tennis court, fitness center, medical center, supermarket, 24 hour security and maintenance, landscaping and parking. Parking, lounge areas and swimming pools are free used.